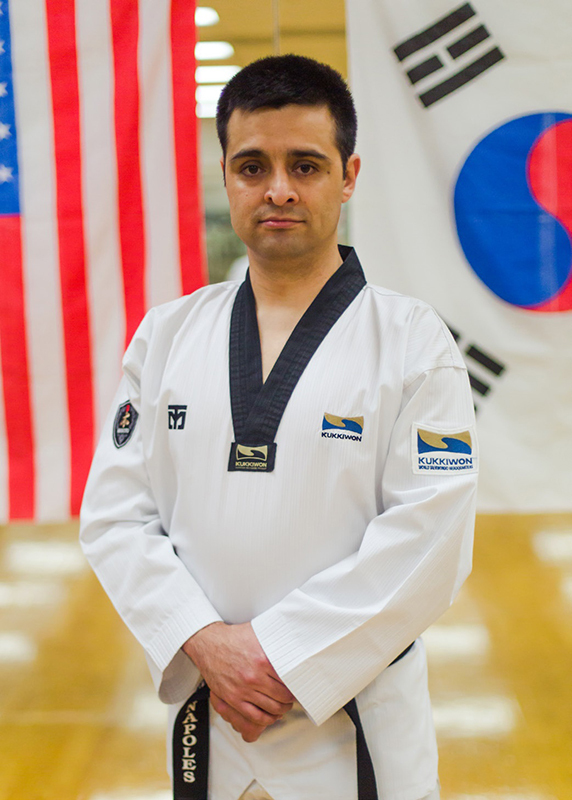 Master Jose Napoles was introduced to Taekwondo when he was a young child through a Master who volunteered with young children on his weekends. Although he was not able to afford continuous lessons as a child he pursued his passion, and, as a teenager, joined the World Taekwondo Federation to officially study Taekwondo. He continued his training attending seminars and working with the students in his local community as an instructor between 1998 and 2006. In the late 2000’s Master Napoles moved to the United States as part of his career, and for a time was a Taekwondo Student without a home. During that time, he became associated with both the YMCA of Southern Indiana Taekwondo and Grand Master Kim. Under Grand Master Kim, Master Napoles was able to continue his Taekwondo studies, and earn his 5th Dan Master Certification. Meanwhile, he began the process of rebuilding the struggling YMCA of Southern Indiana Taekwondo expanding to two locations and rebranding the group to Southern Indiana Taekwondo as it began its journey from its ACTA roots to standardization with the World Taekwondo Federation. All of his hard work earned him the Volunteer of the Year award in 2015 from the greater Louisville YMCA for the Clark County Branch. In 2017 Master Napoles felt it was time for Southern Indiana Taekwondo to retire. The students were now studying curriculum approved by Grand Master Kim, and the instructors had committed themselves to the World Taekwondo. Consequently, Master Napoles has founded Choong Sung Taekwondo and chosen the Phoenix, as designed by the Indiana University Southeast Design Center, as the School’s Mascot to represent the rebirth of the organization and show that through adversity we rise.